Come share your experience and perspective as a Wild One by participating in our November Potluck Panel. Our goal is to encourage a casual yet lively exchange of information about many of the opportunities available for Wild Ones Members to put our knowledge of and passion for native plants to work in our local communities and beyond! Bring native plant seeds to share, where we will have our annual SEED EXCHANGE as part of our potluck dinner and program. 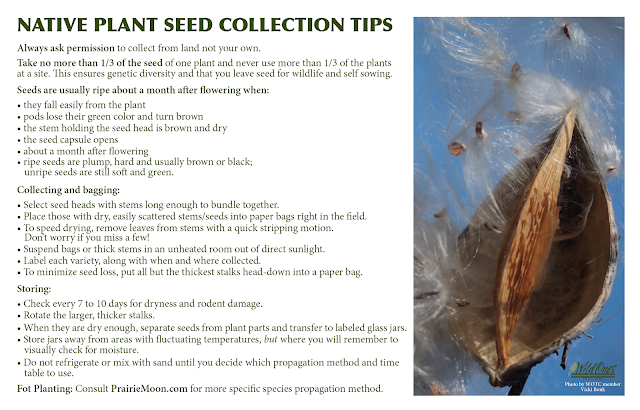 Not sure how to collect or store seeds? Check out our handy guide to success! Click here for a printable pdf. We will also have a winter seed sowing demonstration! Come learn how to get a head start on your native plant garden! And don't forget to bring a dish to share at the potluck dinner!